Fire is a damaging component of Grand Theft Auto games, designed to inflict a constant amount of damage on anyone or anything for a period of time. Introduced in the original game, fire has long been utilized as a weapon in game via the flamethrower and Molotov cocktails, which were both introduced in Grand Theft Auto 1 and Grand Theft Auto 2, respectively. Fire in the Grand Theft Auto series has changed over time as the game engine is improved or recreated repeatedly. GTA 1 initially programmed fire for use in its flamethrower, the only flame-based weapon in the game. The flames of the weapon were primarily effective in setting people alight in short range; even if briefly in contact with its flame, the person remain on fire for a period of time, losing a portion of or all of their health; feeding more fire to the person will result in a quicker death. Vehicles, however, are less likely to remain on fire when out of the flame's way. The player will constantly have to fire the flamethrower onto a vehicle until it explodes and is destroyed. GTA 2 carried over GTA 1's fire mechanics, while introducing Molotov cocktails as a new fire-based weapon. The Molotov cocktail, which functions the same way as GTA 2's grenade, generates an explosion and a ball of fire, but behaves more like a small-scale explosive that does not inflict long lasting fire damage. Fire is also introduced as a clear indication of a vehicle's imminent destruction; as a vehicle is progressively damaged, a small flame will emerge from the vehicle and grow until the entire vehicle explodes when totally destroyed (killing any occupant inside). Grand Theft Auto III retools the effects of fire with devastating results. Upon impact after being tossed, a molotov cocktail generates a ring of fire in its vicinity, torching anything within it, and leaving a temporarily lingering blaze in the center. In addition, fire may now continuously burn a vehicle, and the player themselves may also be burned if in contact of a flame. The flamethrower, however, functions similar as before. The concept of severely damaged vehicles in flames was also brought over to GTA III, but is used simply to indicate a vehicle is completely damaged and is on the verge of exploding. The system remains in games where the GTA III engine is recycled, including Grand Theft Auto: Vice City, and Grand Theft Auto: Liberty City Stories or Grand Theft Auto: Vice City Stories, which are based on GTA Vice City's engine. 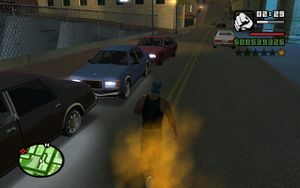 Grand Theft Auto: San Andreas modified and extended the fire's presence in game. Explosions of any form may generate fire in its surrounding, and fire has the ability to grow, spread and die out. If the player lingers around the fire it will continue to grow, it does not simply burn out. Grand Theft Auto IV adopts more realism in the manner fire behaves. The flamethrower was dropped while Molotov cocktails are retained. Fire may still inflict injury on a person, but the fire deducts a random amount of damage as the victim may attempt put out the flames by using the "stop, drop and roll" technique instead of simply running around in previous games. Fire is still an indication of a vehicle's soon-to-be destruction as the engine may erupt in flame, but fire from the gas tank(s) of the vehicle is the game's final sign of a vehicle's imminent explosion. Fire may also destroy a vehicle's tires, burning them before they explode and expose the rims. When a vehicle explodes fire will burn out of it and the player will be instantly set on fire if he steps in it, however small ground fires caused by Molotov cocktails will not burn the player instantly like in previous games. Instead the player must stand in the small fire for a few seconds before catching alight. Unlike in previous games, fire does not spread as easily and will stop burning after a while. Since GTA 2, various methods were invented to allow the player to overcome fire, be it on themselves or others. The most apparent addition is the ability for the Fire Truck's water cannon to extinguish fires in GTA III. When aimed correctly, fire may be put out with water as white smoke or vapors emerge; this system has remain unchanged since. Aside the Fire Truck, the SWAT Tank in GTA San Andreas comes mounted with a similar water cannon that is capable of putting out fires in the same manner. Another fire fighting tool is the Fire Extinguisher in GTA San Andreas, which allows the player to extinguish small groups of fire when aimed directly at them. Due to its use, the extinguisher may be utilized in two of the game's missions, Burning Desire and End of the Line, when the player may be required to clear paths in burning buildings. In GTA Vice City, GTA San Andreas, GTA Liberty City Stories, GTA Chinatown Wars and GTA Vice City Stories, the player may also be awarded invulnerability to fire by completing specific levels in the Firefighter side missions. This allows the player to burn without losing their health. This page was last modified on 25 March 2012, at 00:01.